iOS Data Backup & Restore lets you selectively backup and restore whatever you want from iOS devices/backup. 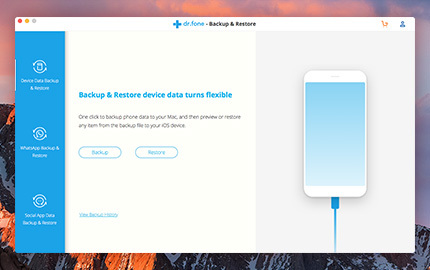 iOS Data Backup & Restore lets you do a whole backup of almost all data on your iPhone and iPad, or you can selectively export the data that you want to keep on your computer. When there is a need, you also can restore the backed up data to your device by selecting the items you want. It will be a better choice than using iTunes or iCloud. Backup and restore iOS data wiht one click after connecting your device. You can preview details of all your iOS backup files with this iOS backup and restore program, so that you can manage your iOS backup well. If you want to read or print your data, you also can export items in your iOS backup as an HTML file or others that you want. It's up to you.